An OECD study, published today to mark International Women's Day, reveals that, globally, women are paid almost a fifth less than men. 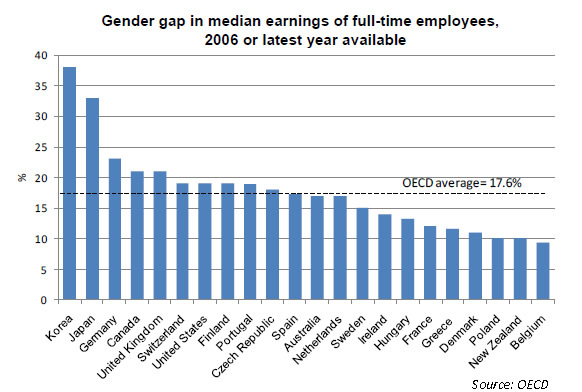 An OECD study, published today to mark International Women’s Day, reveals that, globally, women are paid almost a fifth less than men, with the gender pay gap varying greatly, from a 30 per cent gap in Japan and Korea to a a 10 per cent gap in Belgium and New Zealand; in Britain, the figure is closer to the 20 per cent average. Today’s OECD report also reveals 62 per cent of women in paid work, with a quarter of all women working part time compared to just 6 per cent for men. Women spend more time doing unpaid work and “spend at least twice as much time on caring than men”, adds the report, with the number of children in a household one of the biggest determining factors. Another point of note was that public spending on childcare and pre-school services in OECD countries was on average only 0.6% of GDP, the amounts again varying sharply, from 0.1% in Greece to 1.3% in Denmark, with Britain once more in line with the average. Earlier today, the prime minister described the absence of women from the boards of some of Britain’s top companies as “completely unacceptable”, saying it was “wrong” that only a tenth of directors in the UK’s top 100 companies are women. “It [the EHRC] likened women’s progress to a snail’s pace and said it would take a snail 73 years to crawl from Land’s End to John O’Groats and halfway back again before the numbers of women becoming directors of FTSE 100 companies was the same as men. When you say globally, you mean “in the developed world” right?